Apologies to members of my family and friends who are still getting hammered with winter weather, but spring has arrived in this part of the country in a big way. Trees and daffodils are blooming, lawns are already being mowed, and my husband recently completed two full days of leaf and debris cleanup around our property. 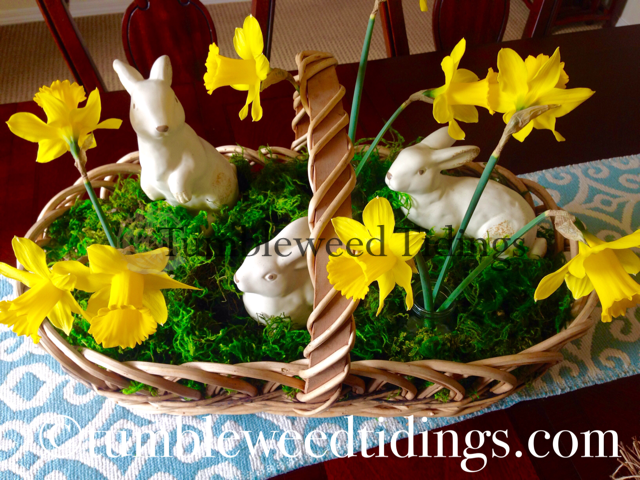 In preparation for Easter next weekend, today I’m sharing an easy springtime centerpiece. Whether you are hosting a huge family holiday meal or just want to add some color and texture after a long winter, this centerpiece will bring the feeling of spring to your home! Also, bear with me as I go through each of the steps. So often, we see arrangements, wreaths, outfits, what have you, and it hard to deconstruct them and figure out how to do that at home. When I had my store in Hawaii, I actually taught a couple of holiday centerpiece classes for that very reason. We all like the look, but we’re just not sure how to get there. 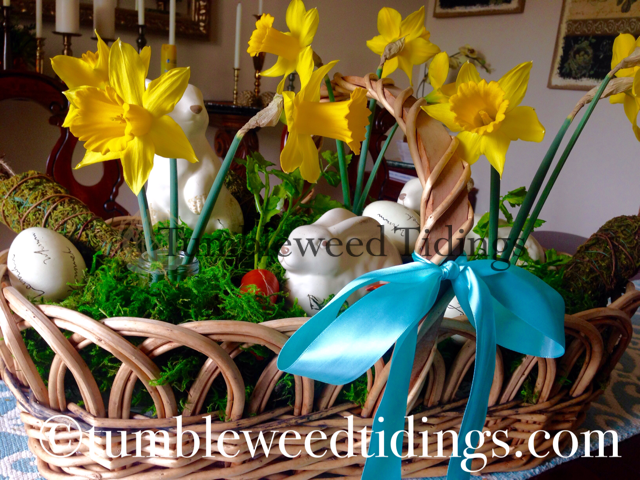 So today, I’ll show you how easy it is to make a spring basket arrangement using just a few simple components. First, I started with a very large oblong handled basket. While visiting my mother in Walla Walla recently, I went into a cute shop downtown called Trove that has some vintage pieces, as well as new items. Outside the store, there was this basket sitting on the bottom of a rack with no price tag on it. I went inside and asked the woman if it was for sale. She said yes, it is $12.00. SOLD! 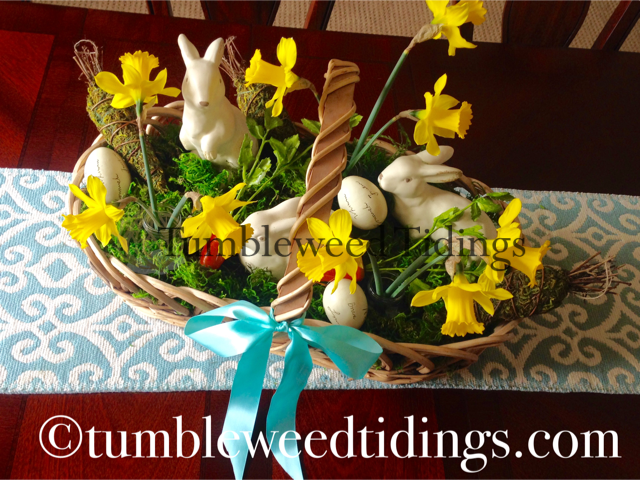 I knew right away that this basket would be perfect for so many things throughout the year, including this Easter centerpiece. Because it is so large, and also deep, I filled the bottom with a cream bath towel. You could also use tissue, florists foam or some other filler. It doesn’t really matter because the moss will cover it up. Next, I nestled three bunnies I have had for years into the towel. One standing, one crouched and one sitting. 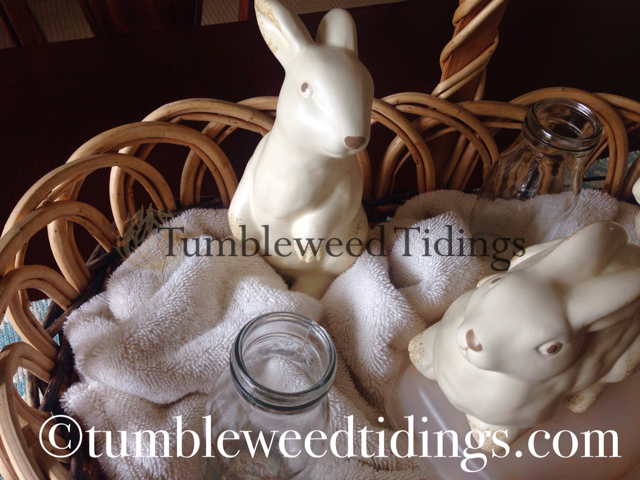 Even with the bath towel, I ended up using some plastic containers for risers to get the bunnies the right height. Then came three small milk bottles to put flowers in. That was the base of the arrangement. 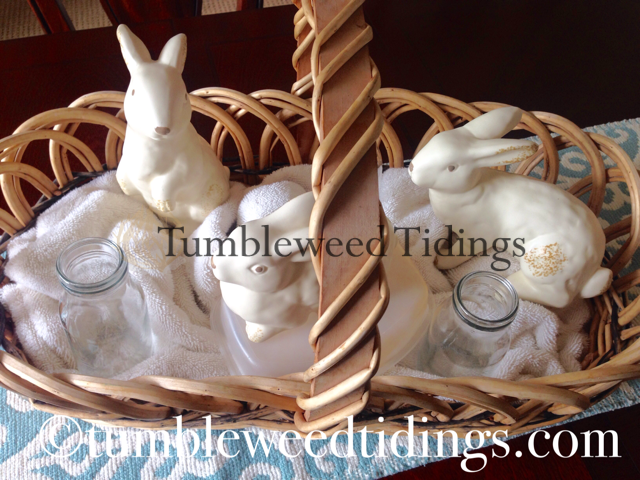 Time to “make it pretty!” First, I placed preserved forest moss on top of the towel and nestled around the bunnies. I prefer the preserved, as the color is a richer green than the other varieties I’ve used in the past. If you haven’t used moss before, I will warn you, it is a little messy. The towel in the bottom of the basket actually became my friend here because it captured the moss and didn’t allow it to fall through the openings in the basket. 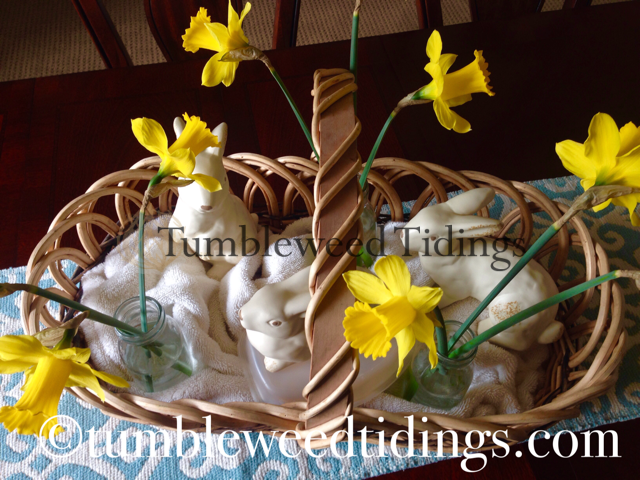 I wanted to add fresh flowers to this arrangement, and luckily, we had several clumps of daffodils blooming in the front yard. If we hadn’t, fresh flowers are readily available this time of year at local nurseries or even the grocery store, some cut and some in pots. If I were purchasing something, I may have chosen pink tulips and crocuses for their beautiful color. But today, it was all about using what I had on hand. 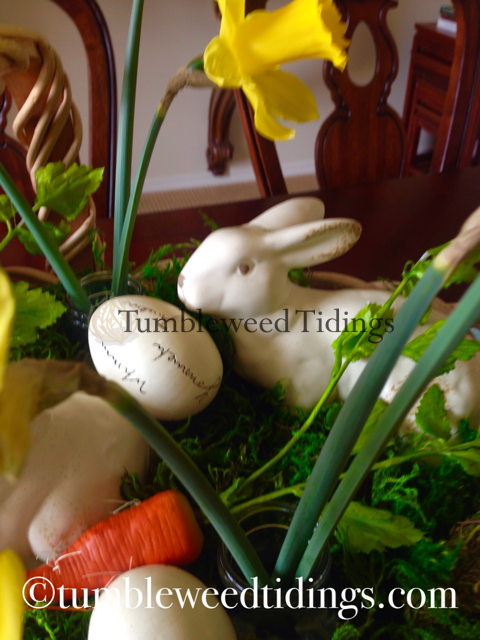 Next, I put three dried carrot-shaped moss items I had in my Easter box, as well as two orange carrots with long tops on them. Then, I added three wooden eggs that had some calligraphy writing on them. The final flourish was a wide satin turquoise ribbon tied in a bow, with the ends deliberately left long enough to drape on the table. I also had some lavender ribbon that I considered, but in the end, I liked the way the blue coordinated with the runner I was using. I think it turned out pretty, and each time I looked at it today, it made me smile. 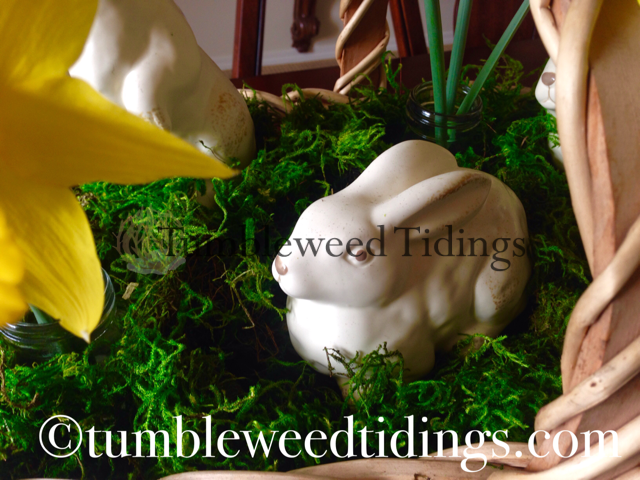 Even though we are not hosting anyone for Easter this year, I still wanted to do a token amount of decorating to celebrate the season. This easy project was just the ticket. Spring is such a beautiful time of year, full of color and a feeling of renewal. I hope you are able to enjoy every minute of it and find new ways to bring a little of its loveliness indoors! I love the idea of fresh flowers. Thanks! They really do look better than artificial, even if they don’t last as long. 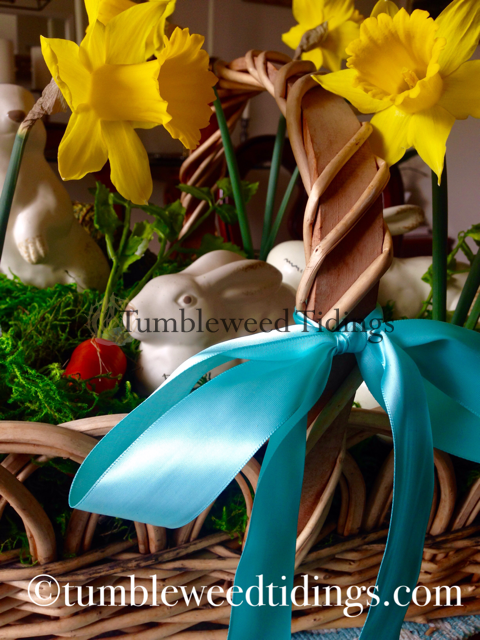 I love this basket it looks so cheerful! 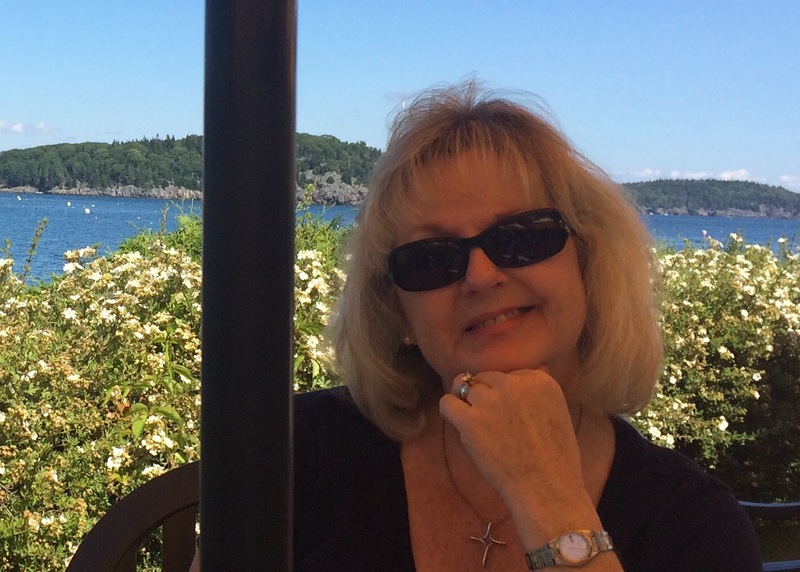 The house looks great just in time for Easter, and just in time to clear the deck in time for “Her” birthday. You might be slightly prejudiced, QT! Love it ! Also love the idea of fresh flowers you can change out when the others have wilted away. I’d use a few hyacinths to make the room smell wonderful . Where did you find the bunnies? Great ideas, Angela! So far the daffodils are staying great, by hyacinths would be lovely. I may do that before Easter! The bunnies are some I’ve have for about 8 years. They are so rustic, they almost look hand painted. They may have something similar at Hobby Lobby or a local craft store. Thanks for the kind words! This is a very pretty basket. I really like the Daffodils with it. Thank you! Jim’s cousin Angela suggested that when the daffodils wilt, replacing them with hyacinth for their lovely smell! That is one thing I really like about the blog is that people come up with great suggestions! Happy Easter! !